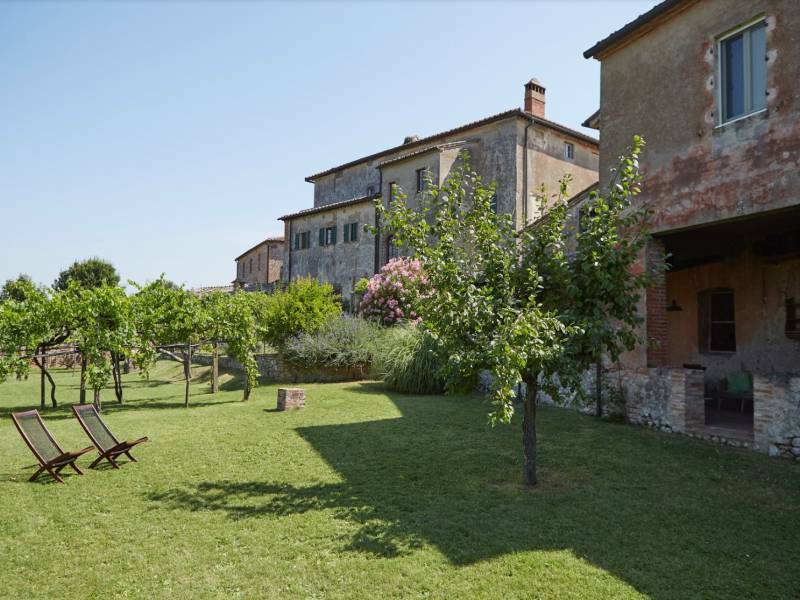 It's only 20 minutes from my house to this agriturismo and yet I had never heard of it before. So really a hidden gem! 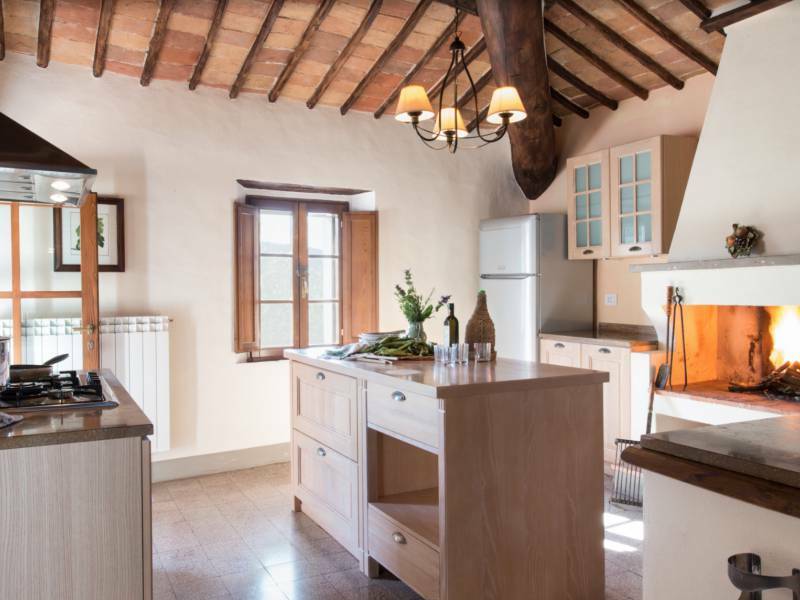 This beautiful authentic Tuscan hamlet from the 18th century is only 15 minutes drive from Siena. Because it is situated on a hill it has a lovely view of the city. From the square of the hamlet you can see the towers of the famous Piazza del Campo in Siena. 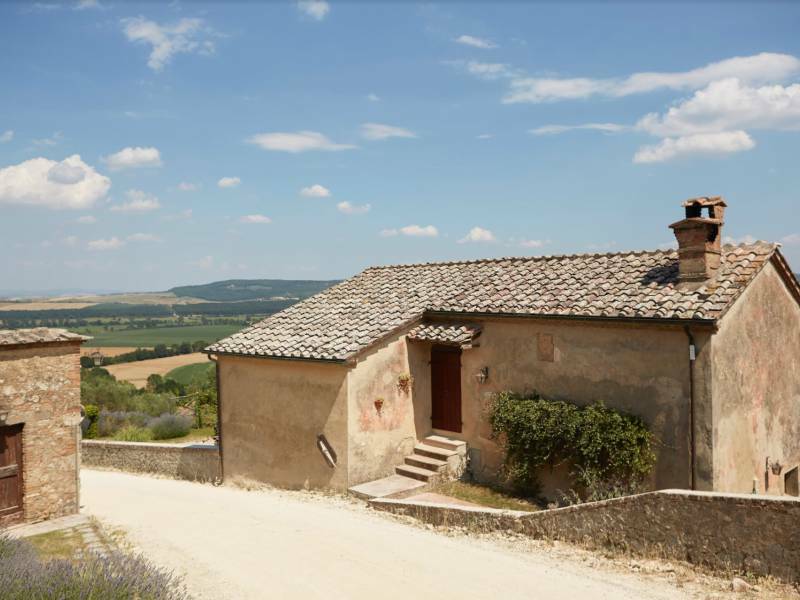 To get to the agriturismo you have to drive up a little dirt road but when you arrive you will feel like you're in Tuscany from the past. I was kindly received by the owner and Francesco, half English and half Italian. They gave me an extensive tour of the agriturismo and I have peeked inside all of the 11 apartments. 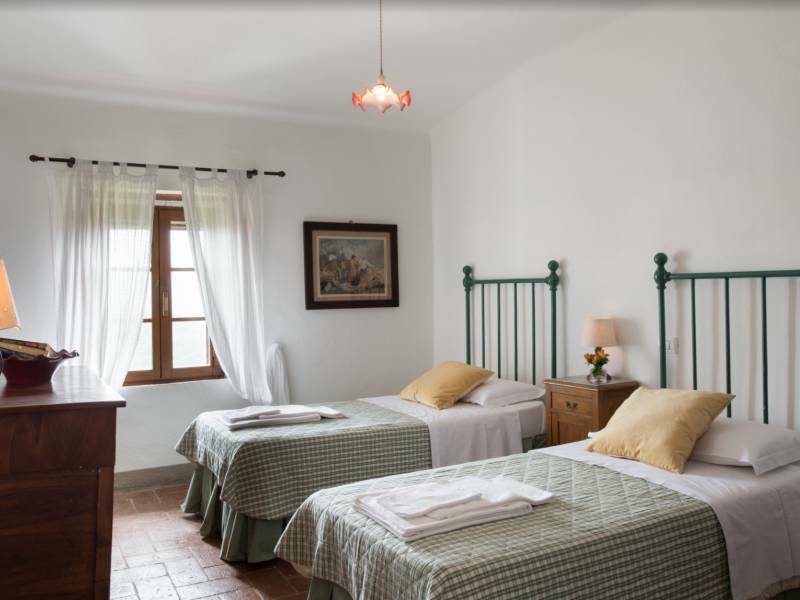 The agriturismo consists of several farmhouses in which the apartments are located. There are also two villas. In one of them the owners live and the other one is for rent. My Italy does not rent out this villa, we only rent the 11 apartments. The piazza, or square, is the central point of the agriturismo. This is where the reception and the restaurant are situated. Weather permitted and given there is enough interest, once or twice a week there is a dinner on this piazza. A unique experience: On long tables dining under the stars with in the distance views of the city of Siena! It's up to the guests to decide wether they want a complete Tuscan menu, BBQ or a delicious wood oven pizza. There is always plenty of wine served so fun is assured! 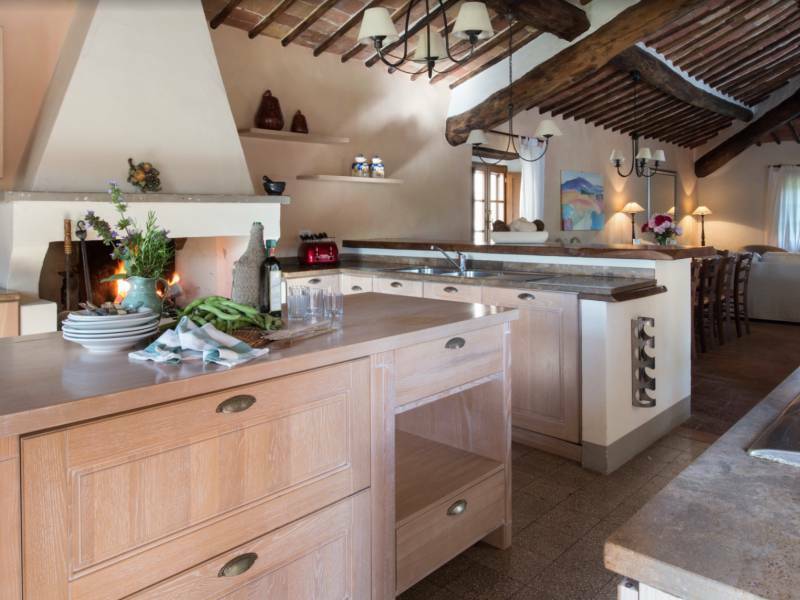 Upon request, also cooking classes and wine tastings are organized. 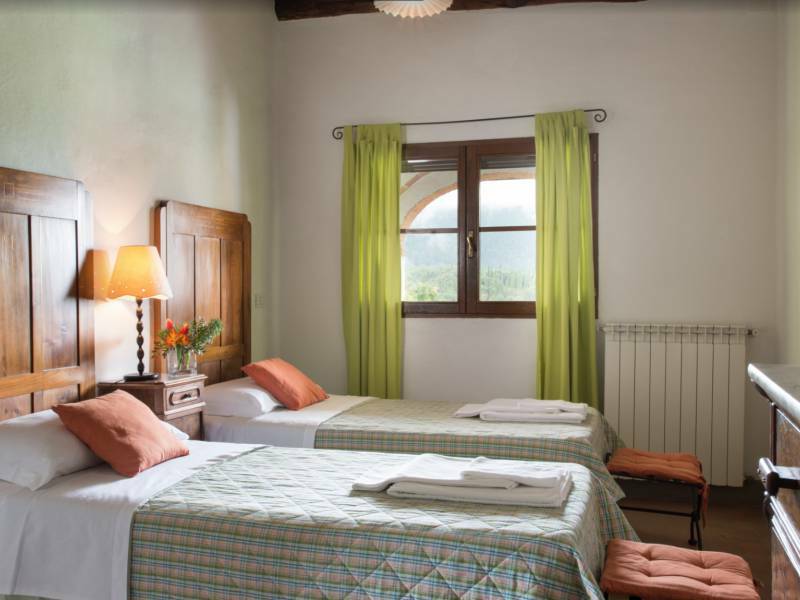 The agriturismo has a game room for the teenagers with a ping-pong table, wifi, pool table and TV. There are two pools on the property. One pool is only accessible for adults (this pool is very deep), the other pool is for families with children. There is a herb and vegetable garden, which are used for the dinners, but may also be picked by guests. Just let Francesco know what it is you would like from the vegetable garden and he would be happy to help. 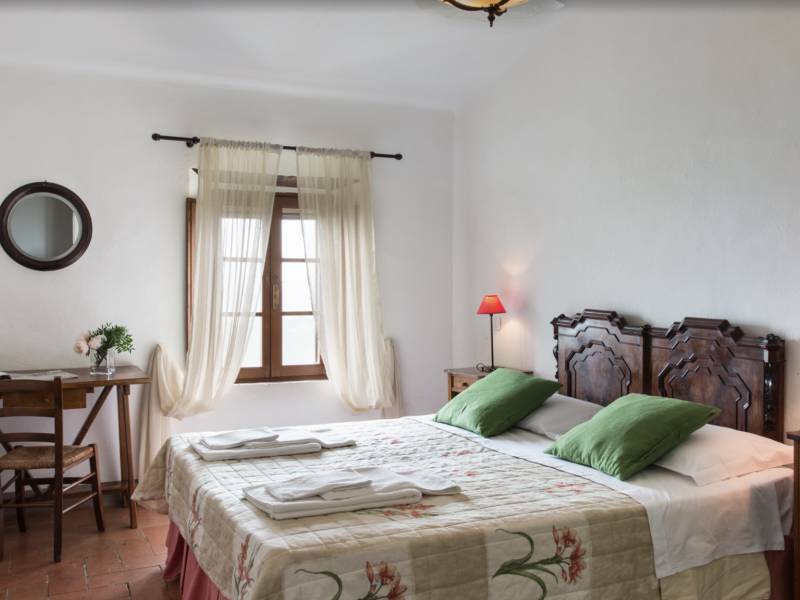 The agriturismo has a total of 11 apartments divided over several farmhouses. 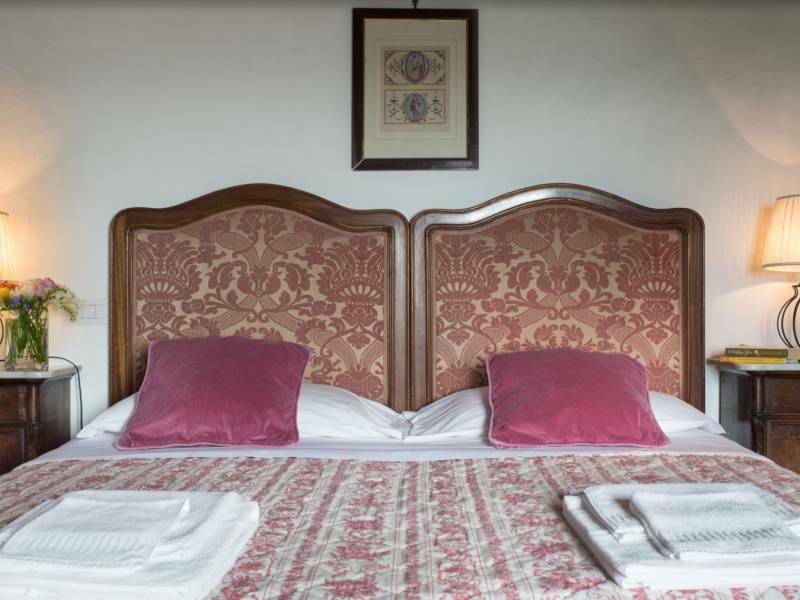 And although the agriturismo and the apartments are not new, I noticed that they are still in good condition and well cared for. The same you could say for the rest of the agriturismo. All apartments have a private terrace, balcony or garden where you can eat outside. Some apartments have a balcony with stunning views, others have a terrace between the olive groves. 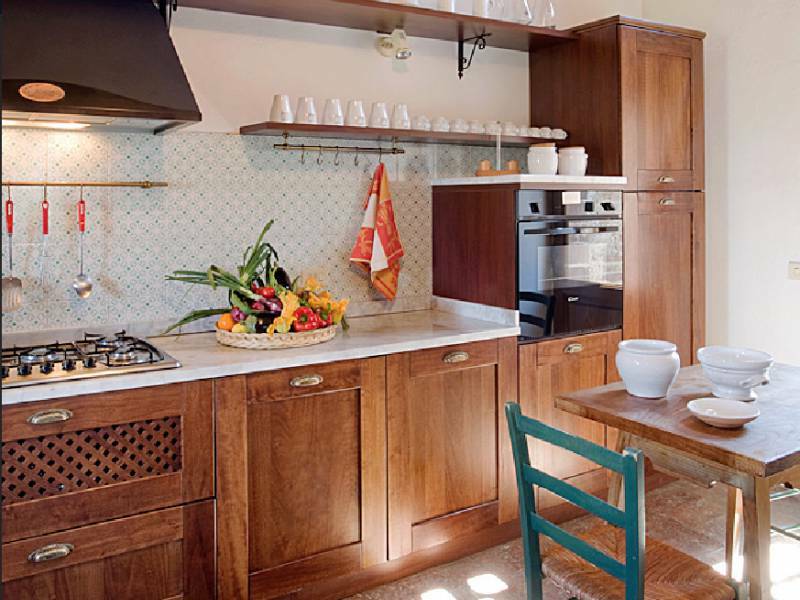 There is certainly enough space at this agriturismo! 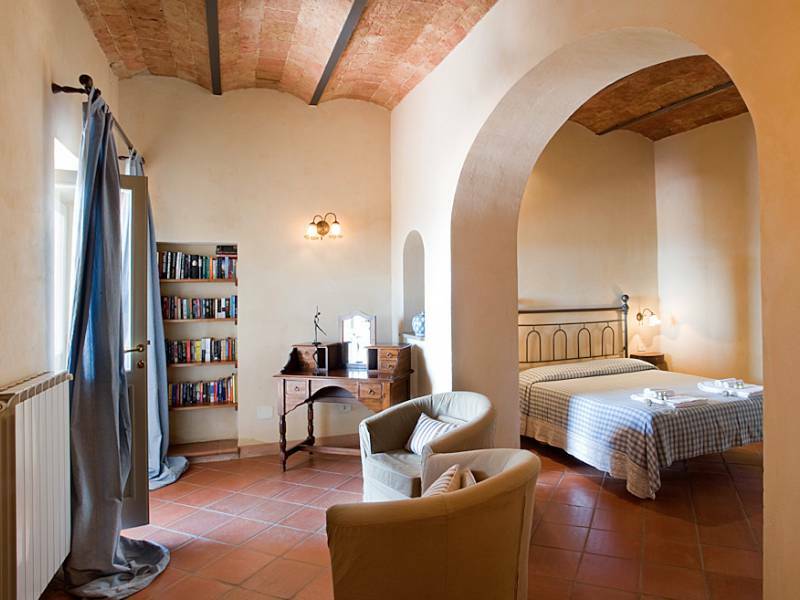 The apartments are rustic and have a typical classic Tuscan interior, often combined with some modern elements. All apartments have wifi, a washing machine and a dishwasher, but no television. 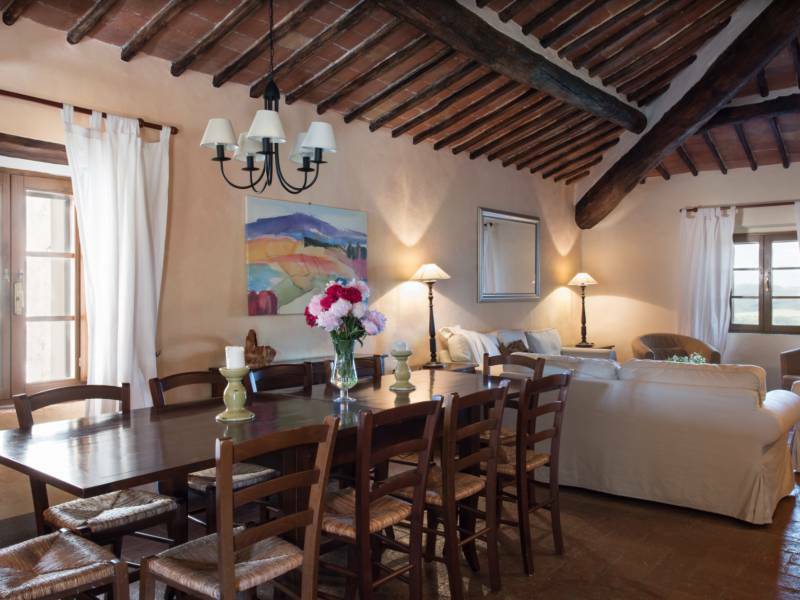 A welcoming and cozy, authentic Tuscan hamlet near Siena. Especially suitable for families with children because of the large apartments. The shared dinners on the piazza are certainly worth it! Apartment consisting of a living room with open kitchen, bedroom with double bed and ensuite bathroom with shower, bedroom with two single beds and ensuite bathroom with tub. The apartment has a covered terrace with table and chairs and is suitable for disabled people. Apartment consisting of a living room with open kitchen and fireplace; two bedrooms with double bed, three bedrooms with two single beds, four bathrooms (two with shower and two with tub). The apartment has a private terrace with table and chairs and a semi-covered terrace to the rear with pergola and barbecue. Apartment consisting of a living room with wood burning stove, kitchen, two bedrooms with two single beds, bedroom with double bed, two bathrooms (one with shower and one with tub). On the ground floor, at the back, the apartment has a large private garden with a semi-covered terrace, table and chairs. 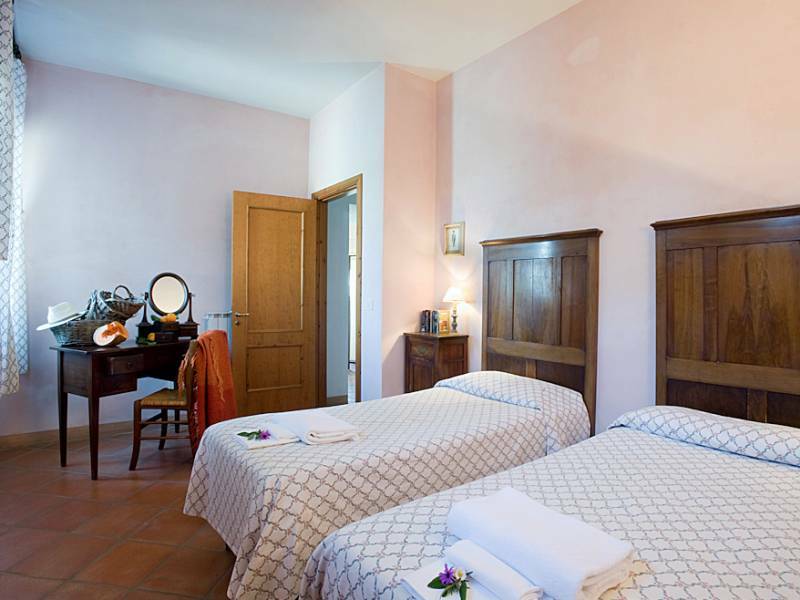 Indipendent apartment between the olive trees consisting of a large living room with fireplace, kitchen, bedroom with two single beds, bedroom with double bed, two bathrooms (one with shower and one with tub). On the ground floor the apartment has a large private garden between the olive trees and a semi-covered terrace with table and chairs. Apartment consisting of a living room with fireplace, large kitchen, bedroom with two single beds, bedroom with double bed, bathroom with shower. The apartment has a small, shared terrace with appartment F (with two armachairs) and, on the ground floor, a big shared garden with pergola, table, chairs and barbecue. In combination with apartment F, these apartments are perfect for two families. Apartment consisting of a living room, kitchen, bedroom with two single beds, bedroom with double bed, bathroom with shower. The apartment has a small, shared terrace with apartment E (with two armachairs) and, on the ground floor, a big shared garden with pergola, table, chairs and barbecue. 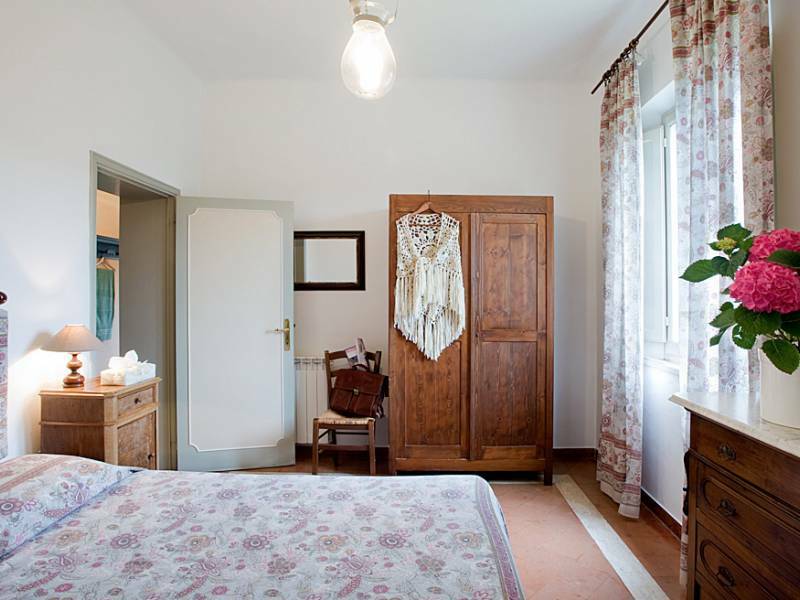 In combination with apartment E, these apartments are perfect for two families. Cosy cottage consisting of a living room with open kitchen and fireplace, bedroom with double bed, bedroom with single bed, bathroom with tub. The apartment has a private garden and a covered terrace with table and chairs. Situated at ca. 200 meters from the main building and swimming pools. Apartment consisting of a living room with open kitchen and large fireplace, bedroom with two single beds, bedroom with double bed, bathroom with tub. Access to the apartment is through an external stone stairs leading to a private terrace with table and chairs. Situated at ca. 200 meters from the main building and swimming pools. Apartment on three levels. On the ground floor there is a living room; a stone stairs leads to a kitchen. On the third floor there is a bedroom with double bed, two bedrooms with two single beds, a bathroom with shower and a bathroom with tub. From the first floor (where the kitchen is) you have direct access to your private garden at the back of the house and amongst the olive trees. There is also a semi-covered terrace with table, chairs and wood oven. Situated at ca. 200 meters from the main building and swimming pools. Indipendent cottage on two levels. On the ground floor there is a living room with open kitchen, bedroom with double bed and ensuite bathroom, a laundry room and a toilette. On the first floor there is a bedroom with double bed and a bathroom. The apartment has a private garden with table, chairs and pergola and a relax outdoor area with barbecue and armchairs. Prices are per apartment per week and include use of water, gas, electricity, bed linen, towels and final cleaning. Shared dinners: twice a week.